In lieu of flowers, memorial donations may be made to Tim Wilson's Grandchildren's College Fund and left at the funeral home. Timothy Wayne Wilson, age 50, of Alta Vista, KS, passed away unexpectedly on Monday, July 4, 2016. Tim was born May 24, 1966, to William Leroy and Anna Lou (McCullough) Wilson in Springfield, MO. Tim was a wonderful husband, father, brother, son, grandfather and a friend to many people. He was a Kansas State University graduate with a Bachelors Degree in Agriculture. He had worked for the Kansas Dept. of Health & Environment for the last ten years. 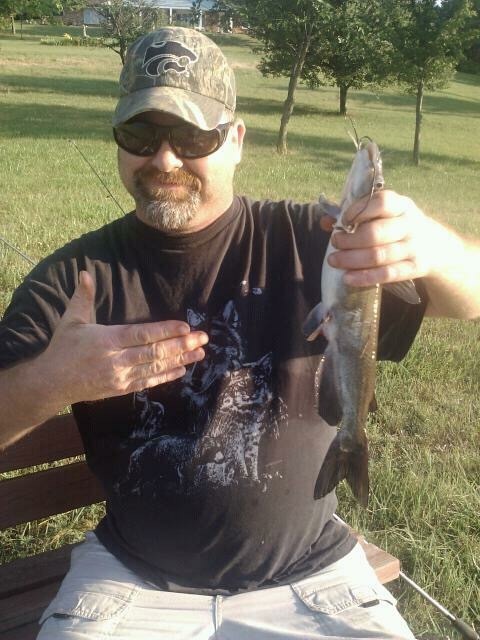 He was an avid outdoorsman, who was always up for a night time fishing trip. He loved his family dearly and was the light of his granddaughters’ lives. Tim was married to his love, Regina, for 29 years. They were married February 13, 1987, and were blessed with one daughter, Danielle. Being an avid outdoorsman, he dabbled in many different things, from waking early for a long walk through an open pasture looking for that covey of pheasants, to teaching his daughter the art of patience waiting for that big buck or the fish to, finally, take the bait. His best days were spent with family outside doing something. Tim was such an easy person to befriend and love. He could make friends anywhere with anyone, and he was the type of friend all can only hope to be. He was always willing to lend a helping hand and would go out of his way to do so. He was truly a wonderful man. Tim was preceded in death by his father, William Leroy Wilson; his father-in-law and mother-in-law, Leroy and Rosalie Rector; his brothers, William Michael Wilson and Russell Lee Wilson; and a nephew, Jeremy Austin Wilson. He is survived by his wife, Regina Wilson of Alta Vista, KS; daughter, Danielle Wilson of Alma, KS; two granddaughters, Baylen Adams and Aurora Adams of Alma, KS; mother, Ann Wilson of Cassville, MO; brother, Dave Wilson and wife Norma of Reeds Springs, MO; sister, Linda Wilson of Neosho, MO; brother, Jim Wilson and wife Kathy, of Springdale, AR; brother-in-law, Ron Rector and wife Margaret, of El Dorado Springs, MO; and numerous nieces, nephews, aunts, uncles, cousins and friends. Words hardly describe the depth of his loss, nor the love he had for his family. He is missed and loved beyond all measure.